The Colorado River roils with some of the West's best whitewater, and the section from the Shoshone Power Plant in Glenwood Canyon to New Castle north of Aspen is one of the most popular. Fishing is also a major draw. Personally dedicated to providing the best fly fishing experience that the beautiful rivers of Colorado have to offer. Gone Fishing provides both guided wade and float trips. Colorado Fly Fishing at its best. Join us for guided fly fishing trips on Colorado's finest fly fishing rivers. The Colorado River is a paddler's paradise in which kayakers and rafters can test their mettle in white-knuckle whitewater, including rapids such as The Tombstone Shuffle, Maneater/Superstition and The Wall. The Colorado River is a major waterway with flows of up to 20,000 cubic feet per second, and the length from the Shoshone Power Plant to New Castle is rated class I to III and sometimes IV. The Glenwood Springs Whitewater Park provides a place for kayakers to try rodeo moves such as cartwheels, spins and flips, and a good spot for others to watch. The Colorado River attracts lots of fishing attention as anglers look to this world famous river in hopes of raising a trophy. The is big water, but fishermen can still utilize waders in fall and winter. For summer outings, rock hopping with hiking boots or fishing from a drift boat will be the best bet. The Colorado River parallels Interstate 70 from Gypsum to Palisade near Grand Junction. The Colorado River can be paddled throughout the year, though it is most popular from May to September. Fishing is best before and after the spring runoff. The Shoshone Power Plant to Grizzly Creek Rest Area whitewater run is two miles of constant whitewater. Put-in: Shoshone Power Plant about five miles east of Glenwood Springs on Interstate 70. Take out: Grizzly Creek Rest Area, Exit 121 of I-70. The Grizzly to New Castle run is 15 miles of mellower, class I and II to II whitewater through the deep gorge of Glenwood Canyon. Put in: Grizzly Creek Rest Area off I-70. Take out: I-70 exit 2 miles east of New Castle. Or shorten the run by taking out at Two Rivers Park in Glenwood Springs, at the confluence of the Colorado and Roaring Fork rivers. Fly fishermen do best on the river before and after runoff. 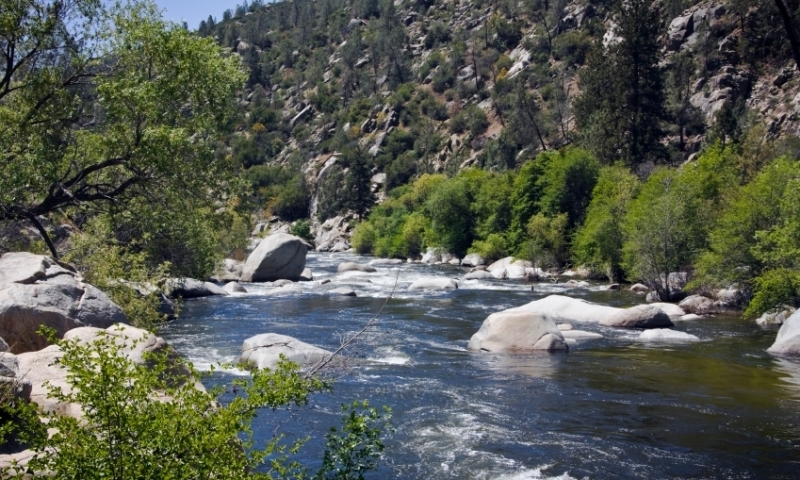 Sure, the river fishes well year-round, but high flows from April to July make things tough. Once runoff subsides, fish the edges along the banks with a variety of caddis and big hopper patterns. Evenings tend to be best. Lure and bait anglers can find some willing rainbows and browns as well when trying the Glenwood Springs area. Larger gold lures like Thomas Buoynats and Jake's Spin-A-Lures will work, but it never hurts to drift a worm along the bottom with a decent-sized splitshot for a quick fish. The top spots are obvious along I-70. Pullouts near the entrance to Glenwood Canyon, the rest area at Grizzly Creek and below Glenwood at New Castle are inviting. All can be good. Follow the bike path 16 miles east through the canyon from Glenwood Springs on a paved, mostly flat pathway. Natural hot springs line the river in several spots, offering warm places to sit and enjoy the scenic canyon.